WCML 001 – Live a wild life! We help spiritual world-changers live wild crazy meaningful lives. Our first 3 episodes will be about each of these: wild, crazy, and meaningful. First up: Wild. 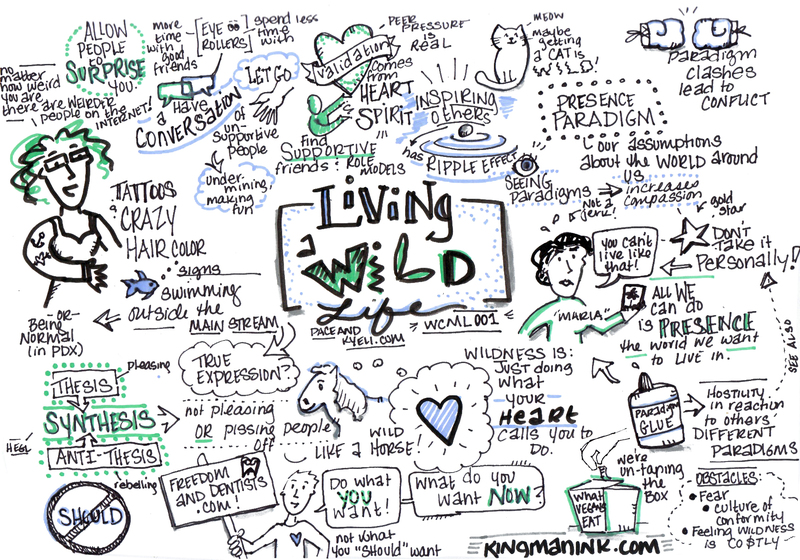 Kelly Kingman of KingmanInk.com drew some dazzling sketchnotes for this podcast! Thanks so much, Kelly! What do horses and Doctor Who have in common? We apologize for the poor audio quality of this episode! We forgot to change the input source to our good mic, and it used the crappy laptop mic. Episode 2 will sound much better. Living a wild life means no longer being ruled by fear, stress, and anxiety. Living a wild life means letting go of being who others expect you to be and having the courage to be yourself – your true self. Living a wild life means freeing yourself from the chains that keep you stuck, complacent, normal.